Critically endangered, this ancient tree was thought to be extinct and is one of the sole survivors of three species of Metasequoia Redwoods that lived before or during the Paleocene & Eocene era. 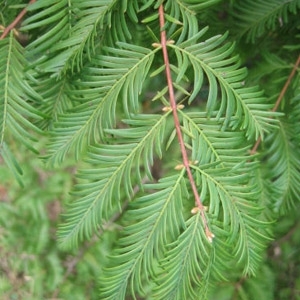 Dawn Redwood are well-suited to modern, ornamental landscape plantings. They are fast growing, like full sun, and are easily transplanted. Prefers moist, deep, well-drained soils, but will tolerate dry soils. Deciduous Conifer.